This script allows you to create choice selections with more than 4 choices, without using any script calls or comments. 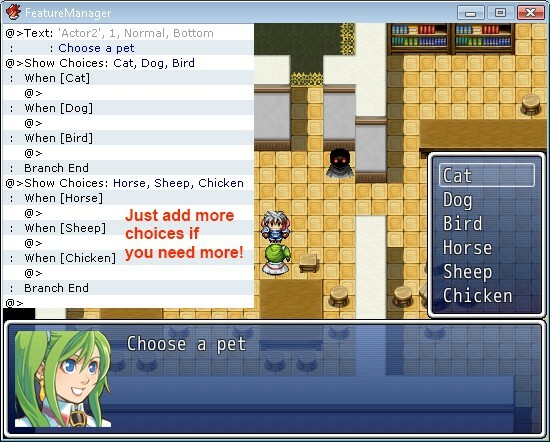 All you have to do is create multiple “show choice” commands and the game will handle the rest for you! You may be interested in using Choice Options as well. If you find yourself running out of room on the screen because there are too many choices, check out Scrolling Choices! If you want more choices, just add another show choice command, and fill it out as usual. Only show choice commands that appear immediately after a previous show choice command on the same level will be merged together, so if you had any other commands in between “show choice” commands, they will be treated as separate choice prompts. Each “show choice” command comes with their own options. All you need to do is select the cancel choice in the appropriate “show choice” command and the script sets it up for you! You should set the other commands to “disallow” otherwise I will simply choose the last one. For the branch choice, all cancel branches will be executed if you choose that, so you should only create a cancel branch on the very last group of choices. 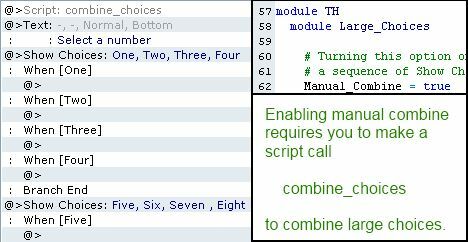 There is an option in the configuration section called “Manual Combine”. 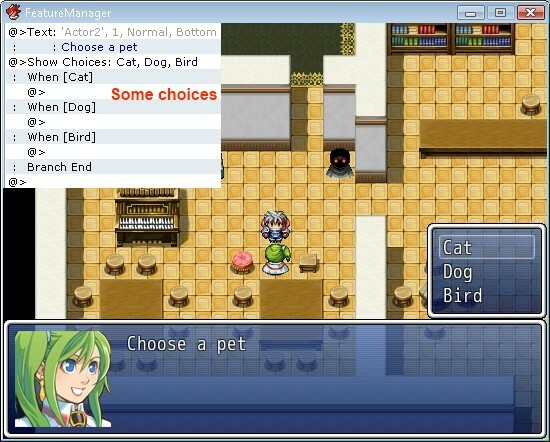 By default, this is set to false, which means all choice commands will be automatically combined together. If you would like to be able to manually specify whether choice commands should be combined or not, you can set this to true. In order to combine the following show choice commands together. This must be done before each set of large choices. We can take advantage of this fact by determining whether the next command AFTER all choice branches is another command 102. If it is, then we can merge it with the initial show choice command (of the current group). Delete the unneeded command 102, and update all branch numbers to correctly merge it with the initial branches. So, question. Is a non-commercial game a free game? Like, one that you don’t generate any revenue from? Or is it just any game you upload to the internet? I’ve been working on a game for a while now, and it’ll be a free game, so I was wondering before I used this script. I’ll be sure to credit you by the way. I’m using Large choices for my game and hopefully go commercial with it. : :You have no class! When I chose “Knight”, it appears “You’re a Knight”, then “You have no class!”. I created a show choice selection with 4 options, along with the “branch” cancel, and selecting the second option only shows the text message for the second option. Determine if there is another script that’s causing a compatibility issue. It looks like you have 5 options. I’m assuming this means you are using two choice selections? 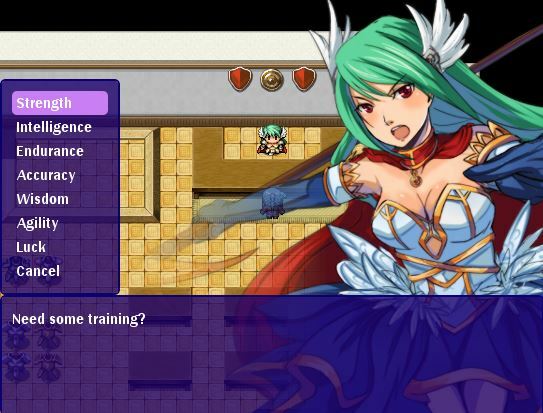 No, I miswrited (I writed “swordsman” two times), I’m using 4 choices and one choice selection. I tried to disactivate all the other scripts, but the error is the same every time. I try to re-download the script. UPDATE: If remove the “def update_branch_choices” part, it returns the wright option, but the cancel option doesn’t work at all. I found your site thanks to a post about fast travel which is what I’m looking to add to my game. Hey, I found your script and it was perfect for my needs, up until I tried making more than 12 choices…so I found out a way to make the choices show up in columns like the inventory. Go to the Window_ChoiceList in the script editor, the core script. Make line 32 at the end say max instead of min. That seems to be the only thing I had to do to make it work. And remember, it is in the actual script. Looks nice. I&apos;m not sure what happens when you have some options that are really long, and how that might affect column size. In general, if you define col_max, you would achieve multiple columns. If you are interested in scrolling options, you might also consider using the Choice Options script which comes with scrolled options. Funny thing is, this actually does scrolling somehow without the Choice Options script, I&apos;m not entirely sure how though. I couldn&apos;t get the Choice Options script to work for me and ended up doing things a bit differently, but I like how it worked out so I&apos;m not changing it. But I&apos;ll have to work on it a bit to see how to make it work with large choices. It&apos;s not a part of my game to have such large choices at this point and I&apos;m not foreseeing any happening of them, but I&apos;ll give it a shot to make it work for others if I have the time. Thanks again for this script! This and Choices Options are great for my game. I&apos;m here to report another incompatibility bug. Supposed I have 8 choices with extra 9th case when pressing Cancel button, when Large Choice script is used alone, it works as intended. However, when I use this script with Choice Options, the extra 9th choice nor any choice is executed at all as if there is nothing. But if I take out Choices Options, it will work again as intended. Is this script free for commercial use? It is very useful and solves a very simple problem. I want to use it to select months on a calendar and four months just isn&apos;t enough. A commercial license is required. I’m having a weird bug happen to me. Say I make two choice windows with all choices filled. The first choice branch will have the choices 1, 2, 3, 4, and the second will be 5, 6, 7, 8. On the first time activating those choices, it displays correctly, but if I activate them again it duplicates the second choice branch. So it turns into this: 1, 2, 3, 4, 5, 6, 7, 8, 5, 6, 7, 8. Then on the third try it would turn into this: 1, 2, 3, 4, 5, 6, 7, 8, 5, 6, 7, 8, 5, 6, 7, 8, and so on. Has this happened before? I am unable to reproduce it. I created a Show Choices command for 1, 2, 3, 4. Then created another Show Choices for 5, 6, 7, 8. Verify that this occurs on a new project and determine whether it’s a compatibility issue. I forgot about making a new project. -_- Sorry about that. It works on it’s own. Just need to find which script is causing this. I do have some that change the font, but nothing major. So sorry for bothering you about that. It was a problem with “Event Trigger Labels”, and thankfully I don’t really need it. Thanks anyway! I’ve updated the script to be compatible with the trigger labels. Wow, that was fast! It works perfectly now, thank you! okay it worked that time. okay then let me say this. this might have been my problem the whole time. i have been trying to make it to where the player can choose whether they want to be any of the classes before the start of the game. but it kept giving me that error message. I am not sure what could be the problem. How i did it. i copied the script and i put it where it belongs and i left it havent done nothing to my game or the script. i pressed play game and it says that message. Can you create a new project, insert the script, test if it still fails, and then upload it somewhere? This script was meant for Ace. Are you using Ace? line 87:NameError occured undefined method ‘clear’ for class ‘Game_Interpreter’ how do i fix this? Place this script below Materials and above Main. Evidently not. aheh. Upon further tinkering, it appears there was an error in copy/pasting the script into the script editor. I have no idea what the deal was, but everything is working fine now. Thank you for your time and your patience. I get an error when I run this. Script ‘Large Choices’ line 215: NoMethodError occurred. Can you post an image of your event (link to image host)? Doesn’t look like anything’s wrong does this happen in a new project with only the Large Choices script? You are an outstanding coder thank you! I’m glad the script is helpful.